In conjunction with ABIM’s February 3 announcement about changes to its Maintenance of Certification (MOC) program, I extended an invitation to ABIM’s nearly 220,000 certified physicians to participate in an online discussion about the organization’s policies, programs and activities. How might ABIM improve its work so that the credentials it offers to physicians better reflect the needs and values of the internal medicine community? 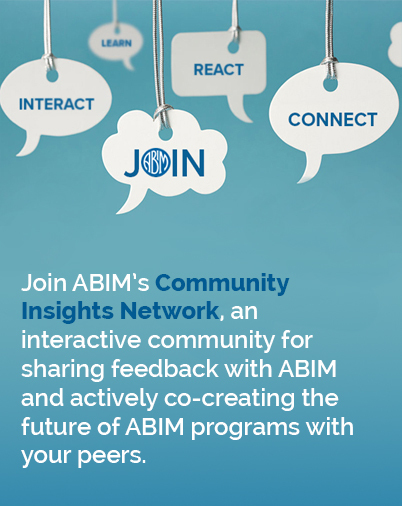 During the two months that the Transforming ABIM Google+ community was active, more than 730 members joined, with many providing candid feedback and ideas. ABIM staff and I appreciate many of the insights that diplomates and others shared. The community expressed a shared commitment to “keeping up” (or put another way, “staying current”) professionally throughout their careers, and recognized that physicians do so by engaging in a wide variety of activities. While some acknowledged that ABIM’s MOC program and its activities have helped them keep up with changes in medicine, many stated that they prefer other methods of doing so. And many physicians would like ABIM to offer a more straightforward process for them to earn MOC points for activities they are already doing. Increasing representation of practicing physicians on all ABIM committees to ensure their perspectives are adequately considered. Ensuring program activities make the best use of the time physicians spend on them. Improving transparency and communication about how MOC program fees are determined and how they are used. Community members highlighted the need for more research demonstrating how participation in ABIM’s programs translates to providing better care. While most physicians in the community acknowledged the need for initial certification, some noted that MOC activities should be optional, rather than tied to certification status. It was also suggested that the requirement to maintain an underlying specialty certificate for some areas was overly restrictive and should be reexamined. Many community members provided ideas to make MOC activities more relevant and less burdensome, while others questioned their value altogether. Participants also expressed an eagerness to hear ABIM’s specific plans for addressing the issues that were raised on Google +. As ABIM moves forward, it will continue to listen to the internal medicine community and is committed to designing a new MOC program with the community. We have already held a series of meetings to elicit feedback and will create additional ways for you to engage in this community-design process over the next few months. Throughout this process, we will keep you updated on what we’re hearing and let you know about additional ways you can provide feedback. Please feel free to share your thoughts with me directly at rbaronmd@abim.org.